Today I had the great honor and gift of taking a class titled “Ways Poetry Can Enliven, Illuminate, and Improve Your Prose” with poet and professor Julie Paegle. At one point, she gave us each a poem on a small sheet of paper that we can carry with us out in the world to memorize. Mine was “The Reassurance” by Thom Gunn. (I think it may have been her intention or prayer to participate with the universe when she handed them out. Each one was different, and more than one person said she must be psychic.) In one exercise we were told to read the poem she picked for us, choose something we loved or hated about it and take that with us into a poem we wrote ourselves. This is the poem that came to me. near a chain link fence. Yesterday morning I heard a mockingbird singing on the telephone pole outside my bedroom window. It had been singing for a while before it came to me–this was the first mockingbird song I’d heard in months. I lay in bed and let it wash through me, the pleasure and the delight and all the many layers of mockingbird meaning laid down over time. My big love brought the mockingbird to my world fourteen years ago. I still think of him sometimes when I hear one, the two of us sitting at the kitchen table in my Santa Rosa apartment on a warm summer night, the mockingbird’s song drifting in the open windows from somewhere in the nearby dark. I still have never read To Kill a Mockingbird, though I think an old tattered copy of it may still be somewhere in my closet. I have picked one up more than once through the years from one musty used bookstore or another. I think I have been both intrigued and afraid to read it. Does a mockingbird die? Last Wednesday night the Camelot Theater was showing the film with Gregory Peck. I’d hoped to ride my bike to see it and try out my new headlight, but I let my work get the best of me. Today I read in the morning paper that Harper Lee is having a second novel published in July. Now I think I must read her first one, and watch the movie, too. And if I love it, there will be a sequel waiting. I like few things better than getting to read more about characters I’ve come to love. Maybe I’ll make it another mockingbird summer. New moon day, and I want to return to practicing my writer’s craft. I’ve missed it, this relationship with myself, with my imagined readers, known and unknown. I’ve missed the weight of my notebook propped against my thighs, the whisper of my hand inching across it, squiggly lines that harbor meaning etched in black upon the soft white page. I hope I am really returning to my writing now, but I tell myself even only an entry or two for my blog will be a victory. Still, I am hoping for more. I want it back, a part of my days. I can’t say exactly what has kept me away. It is not lack of time, I know, though for a few months I did have less of it. More, if I would guess, it is an unwillingness to meet myself here. But I miss my writer self. And I don’t want this to be my reason, to not want to look or to dig, to refuse to unearth. I want to be willing to scrape away the layers of dirt again, pour water like rain, the hidden made clean, resurrected. I want to thrive again among the new-washed relics. I’m riding my bike home from the laundromat on the path that runs along Highway 111 when two motorcycles fly past on the road. My body startles and cringes, shock to ears and cells and heart. “Why aren’t things like that outlawed?” I shout to the hot air as I push the pedals in the afternoon heat. “There’s no reason we should have to live with that kind of blaring, grating noise,” I say. I am only grumbling now, my heart finding its rhythm again. I want to live in a world without cars, I think for the fourth time this week. But is there such a place, one without sacrificing all connection to the modern world? If I flee to the country, there is still always a highway somewhere nearby, the steady background of engines and heavy masses moving past. Do any of our communities ban vehicles, the way some ban leaf blowers? If I had moved to Todos Santos ten years earlier, it would have still been a slumbering fishing village on the rise, only a thin ribbon of traffic on the highway marring the quiet. But when the burgeoning expatriate community started building their homes, the first thing the locals did with their money was buy big shiny pickup trucks. What would it have been like to make my way across town on the dirt roads there without a car in sight? 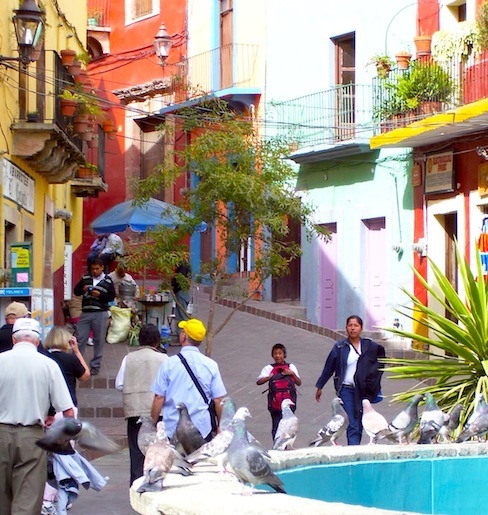 When I visited Guanajuato, I was thrilled to discover several blocks of their downtown closed to traffic. The streets were for us, for humans walking or climbing the crisscrossing stairways up the steep hillsides, the callejones that branched off all over the small city. I wanted to live there, stood for a long time in the middle of the road studying a house for rent and dreaming. And Ajijic was not a town with motorcycles screaming through it. The narrow cobblestone streets did not lend themselves to speeding. Instead, expats ambled past in golf carts, kids drove ATVs and somber middle-aged caballeros rode their horses, or practiced their parade gaits on a quiet street, the hard hooves ringing against the cobblestones, more music than noise. But here, where many of the surface streets have a 50 or 55 miles-per-hour limit, there are always huge blocks of steel hurtling past you. I shrug off my momentary terror at the motorcycles roaring past and the anger that followed it and keep my bike moving west, glad of the small buffer of palm trees between the highway and the bike path. All those loud chunks of heavy metal rocketing by are disconcerting, a constant looming threat to skin and bones. I wonder, not for the last time, if there is a village or an island in this world without cars I might one day call home. Maybe I need to give Guanajuato another look.